Vitamin D is often called the sun vitamin because our skin will produce it when exposed to the sun. In the past since school, we were only taught that vitamin D is needed for bone health and the best time is in the morning. But nowadays, many literatures have shown that it turns out that vitamin D is not only beneficial for bone health, but also can improve the immune system. There are 2 kinds of UV (ultraviolet) rays namely UVA & UVB. The difference lies in its wavelength. UVA has a longer wave so it will cause deeper penetration into the skin tissue (dermis) and cause damage to the skin matrix collagen, while UVB has a short-medium wave. UVA is often found at 07:00 a.m. and can also be found through the sunlight that penetrates the glass window, both the house window and the car window. According to Dr. Mercola (2016) & dr. Diane Godar (2009), UVA will actually cause negative effects on the skin, such as melanoma (skin cancer). This is evident from the incidence of melanoma which is more common in indoor workers (office workers) than outdoor workers. Vitamin D is like an ON & OFF switch in the body that can turn on and turn off metabolic and genetic processes to maintain a healthy body. Vitamin D deficiency can inhibit overall body growth and metabolism. 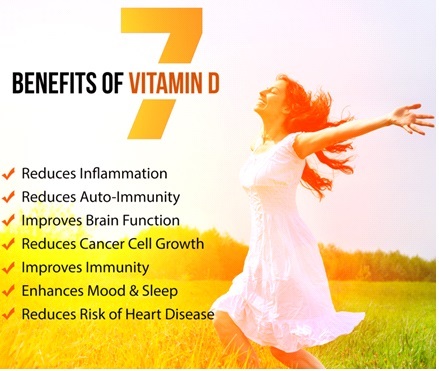 Low levels of vitamin D relate to various types of chronic diseases such as osteoporosis, coronary heart disease, cancer, diabetes, autoimmune diseases, infectious diseases, neurological disorders and depression. Autoimmune disease can occur if the immune system is too sensitive / overwhelmed, and becomes confused to distinguish between an ‘opponent’ or ‘friend’ so that it is not against pathogens, but ambiguously attacks the body's own tissues. With the presence of adequate levels of vitamin D in the body, our immune system is always there to calm and remind, so that the immune system can be more "smart / sober / aware". 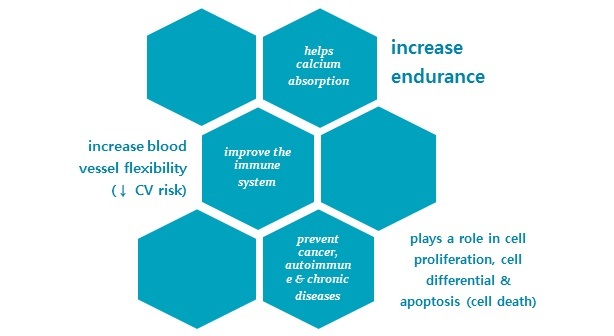 Vitamin D will alert or facilitate the immune system by distinguishing which pathogens and which body tissues themselves to reduce the risk of autoimmune diseases. Simply exposed to UVB sunshine in everyday life. No need to linger especially until it becomes tan or sunburn (burning - it can actually risk skin cancer). Enough 5-15 minutes, several times a day, or routine / consistent. Recommendations from Bill Fleming, sunbathe around 5-15 minutes 4-6 times a week. The best time is when our shadow is shorter than our height, which is around 10.00-15.00 p.m. (WIB) (without sunblock). 10.00-11.00 a.m. to 14.00-15.00 p.m. (WIB). For WITA, usually it’s bright at 05.00 a.m., so 09.00-10.00 a.m. (WITA) would be the best time to get UVB. The more white an individual is, the shorter it takes about 5-10 minutes. And conversely, the darker a person's skin requires a longer time which is a maximum of 15 minutes. As a result of the use of drugs on the skin, can cause photoallergic reactions: changes in the structure of the drug into antigens (foreign objects). Then the body begins to react to allergies and causes inflammation in the area of the skin exposed to sunlight, most of which are topical drugs (topical medications or applications on the skin). To get enough vitamin D, it is recommended that the hands and feet be exposed to sunlight, at least 1/3 of the body or skin. The color of the clothing used should be lighter (white) to improve the absorption of vitamin D. Direct contact with the skin is highly recommended. Facial skin has a thinner layer so it will not produce much vitamin D. To avoid spots on the skin, face skin should be protected (use a hat). For individuals who cannot sunbathe, vitamin D supplements can be a solution. While, food source of vitamin D is found in salmon, sardines, egg yolks, shrimp and mushrooms. But of course, the best source is to synthesize from within the body itself because the body will automatically regulate levels within normal limits. According to the experience of some experts, sunbathing gives an effect on the body's endorphins which has a positive effect. Everyone has different sensitivity to sun exposure, depending on skin type, availability of food ingredients to synthesize vitamin D, skin conditions, skin color, age, and clothes worn. Considering individual factors, sunbathing cannot be generally determined but must be adjusted according to individual reactions. Therefore, identify yourself as best as possible and avoid drugs that react photosensitve & photoallergic such as facial ointments (if not needed).